My initial reaction to my placement was shock…Initially, the shock came from being called first, but, after the ceremony, an ‘aftershock’ of sorts from the reactions of some of my peers. Remarks such as, “Haha, my worst fear being placed that far north,” or “I would never go there!” shook my confidence and shadowed my shining moment with doubt. I wondered at that time what I was getting myself into. So many people seemed to willing to judge Hwacheon at face value, but none were able to identify components of society and culture in the region. In other words, assumptions were made based on stereotypes and heresay. After coming to this realization, I endeavoured to find the hard facts about my placement. I researched and google-stalked some former Fulbright ETAs who provided excellent blogs of their experiences 😛 At this point, I came to realize that there is much to see and do in my region and that I will have the support of my fellow ETAs in my region. We are few, but I am sure that this will serve to make us a stronger team. Although Hwacheon is rural, I will be living near one of my best friends here in Korea and know that transportation within Korea is easy to navigate, so it’s not as if I am being sent to the ends of the earth! My thoughts and feelings regarding my placement have changed in that I have become more confident in myself and my intent for the year. My goals are the most important part of my year and can function independently of geographic location. I came into this experience with an open mind, heart and flexibility. I am so grateful and feel so blessed to be here that it doesn’t feel right to complain about this opportunity. As Mrs. Shim eloquently and wisely stated, “There is neither ‘good’ nor ‘bad’ with placements”. Going into my grant year, I will stay focused on why I am here and how my goals align with my school and local community. After having had my TAPIF teaching experience at 3 elementary schools in France, I am looking forward to working in a smaller school. I am excited for the opportunity to know each of my students by name and to become an asset to my school and local community. I feel as though I will be able to make much more progress with my students and will have the possibility to teach them several times a week. Teaching students multiple times a week might also give me more opportunities to plan my own lessons and fun extracurricular activities–involving English: cooking, holiday celebration, game day…etc– with my students. As an avid outdoor adventurer, I am sooo psyched about the opportunities available in my region. There is a lot of hiking, biking, rock climbing, white water rafting, star gazing and other activities to be tackled. I hope to share my passion for the outdoors with my co-teachers and family and would be interested in beginning a community (or family) garden if possible. I am a WWOOFer; love gardening and found a WWOOF farm near my town where I would be able to volunteer from time to time. I believe that these activities would bring me closer to my community and look forward to getting involved with my community. I will be a ‘regular’ at the local market and service to my local community is important to me. As google hasn’t provided me with much information regarding the resources available in Yuchon (my placement city…near Hwacheon), I am concerned that I won’t be able to be as involved with my community as I am hoping and am worried about being an outsider in the community and peoples’ perceptions of me as I enter the community. One is given but 1 chance at a good first impression, so I want to careful on these grounds. I am soo curious and excited about my placement and my host family and look forward to meeting them! I believe that my host family will be a grounding force for me during my time in Korea and am looking forward to visiting my schools and to meet my students. Again, I worry about a good first impression and establishing/understanding routine and expectations in/with my co-teachers, students and host family. I know that adjustment can’t happen overnight, but sometimes my expectations for myself overshoot the reality of the situation. I try to run before I can walk and worry that this tendency might cause me unnecessary stress. I’m going to take the zen approach to things and take one day at a time (taking notes on essentials and asking whatever questions necessary). The adjustment might be overwhelming, but I am going to try my best to cope with this. I know that this process will be the same for everyone and it will help to know that I have other ETAs who understand what I am going through and to whom I can reach out. Curious about my placement? Read more in the links below! 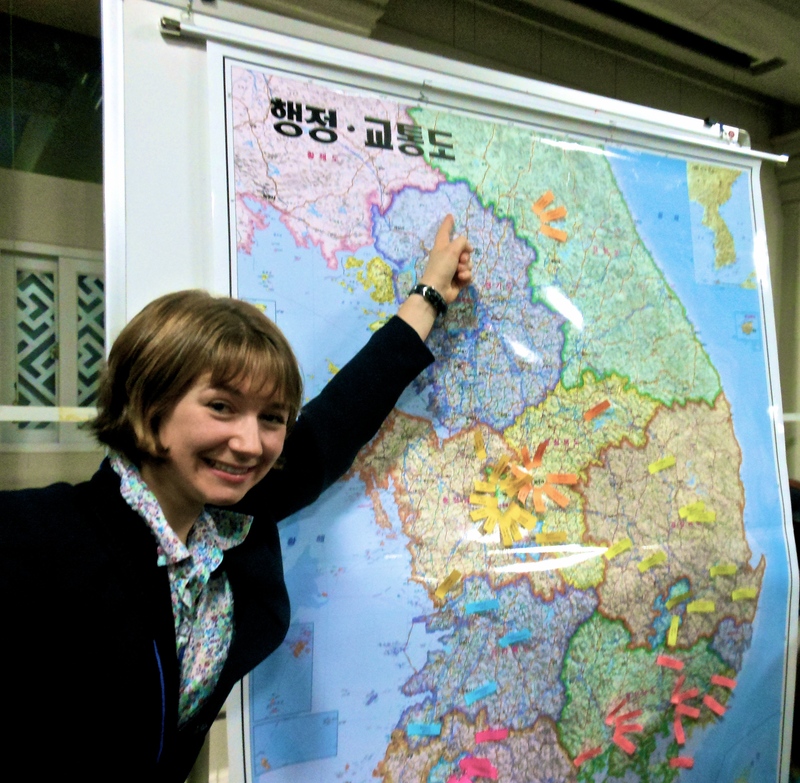 #2 Stars and Stripes Korea: a travel guide to all things up and coming in Korea. From news stories to travel details…check out this blurb on why you should visit Hwacheon! Previous Post Weeks 2-4: Oh how the time zips by!